When I learned that Vladimir Putin was going to travel to South America for the last game of the World Cup and for the Brics Conference, I was concerned that he might be attacked. Now when the US President travels, he flies on one of two identical Boeing 747-200B USAF Presidential State Aircraft. The one that he is riding in is officially designated as Air Force One; the other is carrying staff and reporters, etc., but is also acting as a decoy aircraft making the task of shooting down the correct Boeing 747 more difficult. The planes have constant fighter coverage with AWACS and refueling tankers. In areas over the ocean the US Navy has been known to re-task super carrier task forces to provide USN fighter coverage when necessary. Now Russia remains a nuclear superpower, but it no longer is the overall superpower that the old Soviet Union was with its Warsaw Pact allies. There is no Warsaw Pack now, and many of these nations are members of NATO. The USSR is broken up and long gone. So Russia cannot provide the level of protection to its Presidential State Aircraft, an IL-96-300PU that the American President has. Still, the Russians do take special efforts to keep their Head of State safe. Considering the level of pre-WWIII events currently happening in the Ukraine and the Middle East, and the growing irritation that Globalists and Zionist forces have had with Putin and his Russia, the security experts charged with protecting Putin were no doubt very concerned about his long overseas visit. Putin effectively stopped an Israeli/US attack on Iran almost two years ago and a US/UK/Israeli attack on Syria about a year ago. The US/Zionist/Globalist supported/funded coup against the elected Ukraine government and the resulting conflict was a calculated effort to draw Russia into a war over the Ukraine and thereby tie it down in order to allow Netanyahu free hand to create his long-sought General Middle East War. Putin has proven to be a brilliant strategist and not easy to trap. Hence, I believe that the decision was made to "take him out" of the picture by destroying his state aircraft as it flew over Russia but near the Ukraine on his return from South America. That the Latin American trip included a key Brics Conference in Brazil which was a direct attack on the Rothschild-headed Global Banking Cartel's power over the global economy and financial system was a key factor in the decision that Putin had to be eliminated. Taking the Russian State Aircraft down presented a number of problems. If it were downed over the open ocean, fingers would point at America as the superpower capable of global military action. Host nations did provide considerable security to Putin and his aircraft while he was in their nations and airspace. What better place to attack the IL-96 than over Russian airspace near the Ukraine, shortly after it had left Polish airspace. At worst the coup junta in the Ukraine would be blamed and Moscow might invade the Ukraine in response, thereby tying down its military and freeing the Mideast for a truly horrific general war. The Russians were well aware of the dangers and were actively looking for stealthed fighters and mobile ground-to-air advanced systems with airborne state-of-the-art sensors. A few years ago, Russian engineers devised a way to 'stealth' existing non-stealthy aircraft using a plasma system. This system has been reported on and no doubt copied by various western powers. Now no stealth system is perfect, and in fact the whole field of stealth has had its share of PR hype. The attempt is to create a 'black hole' in the sky that no radar or infrared/etc. signals are capable of being detected. However, no such system is perfect and highly advanced electronic systems can usually detect a stealth aircraft (manned or unmanned) operating in a given area. Based on assorted reports and a general knowledge of military systems including ECM (electronic counter measures) this is what I believe happened in the skis over Poland, Russia and the Ukraine that led to the deaths of 295 people on Malaysian Airlines Flight MH17: Russian Air Force electronic surveillance/ECM aircraft were able to detect a stealth fighter in/near the expected flight path of the Russian State Aircraft. Since shooting down this aircraft was not a certainty, especially since the Ukrainian Junta had just moved a number of advanced 'Buk' ground-to-air missile systems into eastern Ukraine, the Russian ECM aircraft immediately began to spoof things. The IL-96 was likely contacted by satellite secure radio transmissions and told to turn off or change its ID squawking and a nearby large aircraft, the Malaysian Airlines Boeing 777 Flight MH17 was spoofed to cover its normal ID code and replace it with the IL-96 code. "I can say that Putin's plane and the Malaysian Boeing intersected at the same point and the same echelon. That was close to Warsaw on 330-m echelon at the height of 10,100 meters. The presidential jet was there at 16:21 Moscow time and the Malaysian aircraft – 15:44 Moscow time," a source told the news agency on condition of anonymity. "The contours of the aircrafts are similar, linear dimensions are also very similar, as for the coloring, at a quite remote distance they are almost identical", the source added. The Malaysian airliner was now being electronically spoofed by Russian ECM to give the ID of the IL-96. The Israeli flight crew knew that the plane was over Ukrainian airspace, but just barely, and it closed to make a visual contact. What it saw was a white large airliner sized plane. It launched a radar-guided AIM-20 AMRAAM missile from a few miles away to lesson the radar jamming expected to be on the IL-96 and destroyed the target and quickly exited the local area. Early reports, and these are always most important as they are given and reported before a coverup can be initiated, quoted multiple witnesses on the ground that a fighter had fired a missile and this missile had hit the airliner bringing it down. The witnesses thought that the fighter was a Ukrainian fighter such as a Su-27 which has a twin-tail and from a distance looks similar to a F-15 with its twin-tail. The Russians have no advantage to 'outing' the true story. For one thing they helped, by using ECM, to cause MH17 to be shot down. Secondly, without a downed Israeli F-15I, to prove the story, it would simply be a "he said, she said" story that the Israelis and Ukrainians would deny. So we have this on-going back and forth claims that the Junta's Buk surface-to-air missile downed the Malaysian airliner, or that somehow the 'rebels' shot it down, or that the Russians fired a surface-to-air missile that took it down. However, experience intelligence analysts in Europe and elsewhere are not apt to buy a story line that somehow a large airliner was shot down over the Ukraine, when no plane had ever been shot down at this altitude (33,000 feet) before during the on-going conflict and moreover that this same airliner had crossed paths with Putin's State Aircraft, returning from the Brics Conference in South America, only minutes before being shot down. This is an absolute disaster for Netanyahu's Israel. When you try to kill someone like Putin you damn well better get the job done or he is apt to institute a 'payback' that you will not want to pay. Further, a large number of European nations, and others, are realizing that tiny Israel tried to kill the President of Russia. That will not work in Israel's favor. The aftereffects from this event are only just beginning but they are apt to change the world. If true, the direction of the investigation into the July 17 crash has veered dramatically from initial U.S. government allegations that eastern Ukrainian rebels, using a Russian-supplied anti-aircraft battery, were responsible for bringing down the plane, killing 298 people onboard. But the U.S. analysts dismissed those original suspicions because they could find no evidence that such a missile battery had been supplied by the Russians or was in the possession of the rebels, prompting a shift in thinking toward a scenario in which Ukrainian hardliners working with elements of the air force may have tried to ambush Putin's plane but instead hit the Malaysian airliner, said the source speaking on condition of anonymity. After the crash, as U.S. intelligence analysts pored over phone intercepts and other intelligence data, they began to suspect that the motive for the shoot-down was the desire among some Ukrainian extremists to eliminate Putin whom they had been privately vowing to kill -- words initially viewed as empty bluster but which were looked at differently in hindsight -- the source said. If some Ukrainian authorities were hoping to ambush Putin's plane, they also would have had only a matter of minutes to detect the aircraft's presence and make a decision to fire, so it could be plausible that the attackers made a hasty decision to hit Putin's plane before they realized that they had made a tragic mistake. After the crash, the Ukrainian government quickly assembled some pieces of information from "social media" to pin the blame on the eastern Ukrainian rebels and the Russian government for what would have been a reckless decision to supply such powerful weapons to a poorly trained force. The rebels denied having a Buk anti-aircraft battery capable of reaching an aircraft flying at 33,000 feet and the Russians denied having supplied one, but those denials were brushed aside by the mainstream U.S. news media and were rejected as well by senior U.S. officials. Only three days after the crash, Secretary of State John Kerry made the rounds of five Sunday talk shows to embrace the Ukrainian government's assertions although the official investigation into the crash had just begun. The following Tuesday senior U.S. intelligence officials briefed mainstream reporters from several news outlets offering qualified support to the claims by Kiev and Kerry, but some journalists noted the lack of any real evidence and the briefing's curious reliance on "social media" rather than aerial reconnaissance, phone intercepts or other official sources. The absence of this corroborating evidence suggested that the case against the rebels and Russia was weaker than the Obama administration was letting on. Yet, because of the high-level endorsements of Russia's presumed guilt, the U.S. intelligence analysts are moving cautiously in developing their alternative scenario, said the source, who added that another line of inquiry still being pursued is that the Ukrainian military brought down the passenger plane simply to create a provocation that could be turned against the rebels and Russia. Still, the idea of assassinating the Russian president by shooting down his plane -- even if the attack were carried out by hardliners without the approval of top officials -- could have provoked a major international crisis. Nuclear-armed Russia would have almost surely retaliated against Ukraine, possibly with a full-scale invasion which could have escalated into a dangerous military confrontation with the United States. This possibility of a cascading crisis beyond the control of rational policymakers has always been a risk since the U.S.-backed overthrow of elected Ukrainian President Viktor Yanukovych on Feb. 22, a putsch spearheaded by neo-Nazi militias though also supported by more moderate political figures. The U.S. State Department quickly embraced the coup regime as "legitimate," but ethnic Russians in eastern Ukraine, which had been Yanukovych's political base, resisted the new order. Meanwhile, the new Ukrainian government, which gave the neo-Nazis several ministries in appreciation for their key role in the coup, began calling the ethnic Russian resistance "terrorists." New National Guard units, formed from neo-Nazi militias, were dispatched to intimidate ethnic Russians in the southern city of Odessa, where scores were killed when a pro-Kiev mob set a trade union building ablaze. As the crisis worsened, several eastern cities in the Donbass region also voted to secede and an armed resistance emerged against the Kiev regime, which responded by vowing to crush the rebellion with an "anti-terrorist operation" that has included artillery and aerial bombardments against towns and cities held by the rebels. On Friday, a Ukrainian parliamentary group reported that more than 10,000 people have been killed in Kiev's offensive since April, a number far higher than earlier estimates. Kolomoisky, known for his strong-arm business tactics including deploying paid thugs to intimidate rivals, is now using his fortune to finance paramilitary units, such as the Dnipro Battalion which is considered one of the most aggressive and brutal units in the "anti-terrorist operation" in eastern Ukraine. Since the February coup, Kolomoisky also has engaged in a bitter war of words with Putin whom he publicly mocked as a "schizophrenic shorty." But Kolomoisky's fury toward Putin has intensified in the face of the Russian murder charge and other threats to the billionaire's PrivatBank holdings. In private conversations, Kolomoisky has made angry threats against Putin, the source said. Other Ukrainian officials have vowed to kill Putin. Ex-Prime Minister Yulia Tymoshenko, a onetime Kolomoisky ally, said in an intercepted phone: "It's about time we grab our guns and kill, go kill those damn Russians together with their leader." Another curious development was the sudden resignation on Thursday of Andriy Parubiy as chief of Ukraine's national security. A longtime neo-Nazi leader, Parubiy had organized and directed the paramilitary forces that spearheaded the putsch on Feb. 22 forcing Yanukovych and his government officials to flee for their lives. Parubiy refused to explain his reason for quitting but some analysts believe it may have a connection to the Malaysia Airlines shoot-down, the source said. The U.S. intelligence analysts specifically said their evidence does not implicate Ukraine's current President Petro Poroshenko or Prime Minister Arseniy Yatsenyuk, but they did not extend that clearance to the more extreme elements of the government, the source said. As the pieces of this puzzle fill in, the image that emerges is of a possible Ukrainian ambush of a jetliner heading into Russian airspace that had markings very similar to President Putin's official plane. As shocking as that picture may be, there is a grim logic to it, given the demonization of Putin who has been likened to Hitler and Stalin by pundits and politicians from Ukraine to the United States. Powerful people are notoriously unwilling to admit mistakes, especially when it could open them to charges that they rushed to judgment and behaved recklessly. There are similarities with the hasty U.S. conclusions a year ago when sarin gas killed hundreds outside Damascus on Aug. 21 -- and the finger of blame was pointed immediately at the government of President Bashar al-Assad. On Aug. 30, Secretary Kerry declared repeatedly that "we know" that the Assad regime was guilty, but some U.S. intelligence analysts were privately expressing their doubts and refused to endorse a "Government Assessment" which presented no verifiable evidence to support the accusations. The four-page white paper also suppressed the dissents of the analysts. India-US relations have come into focus against the backdrop of the two recent visits to Delhi of senior members of the Obama cabinet. US Secretary of State John Kerry and his colleague, Defence Secretary Chuck Hagel made the first high level political contact with the new Indian government to finalise the agenda for the Obama-Modi meeting scheduled for September in Washington DC. This bi-lateral relationship underwent a major transformation in late 2008 when the long festering nuclear nettle was resolved through a complex modus vivendi that accorded India an exceptional status in the global nuclear framework - and the deeply embedded 'estrangement' was expected to lead to progressively more robust engagement. At the time, the UPA government led by the Congress included the left parties as part of the coalition and the nature of that debate is instructive. The US had provided India a rare opportunity for a geo-political and strategic accommodation which was in Delhi's abiding interest but the domestic political wrangling exuded little perspicacity. A zero-sum game ensued and neither the Congress, hobbled by the Left, nor the BJP in the opposition could evolve an objective and informed bi-partisan consensus on matters of deep politico-strategic import. But for the external interlocutor, even the possibility of a less prickly relationship between India and the US had the desired effect in enhancing Delhi's credibility. It may be recalled that India's strategic relevance rose-and within Asia, the nuances were felt from China and Japan through to West Asia. Yet at a time when the Indian boat seemed to be rising, the hand on the tiller wavered, the waters for sure roiled by the global financial turbulence of that period and rank political diffidence. In the intervening years, the UPA II government and the Obama administration were differently distracted and much of the hope was belied. The low-point in the bi-lateral was the Devyani episode where an Indian diplomat was treated in an extremely inappropriate manner and many of the latent anti-US anxieties in India came to the surface. However to the credit of the two sides, quiet diplomacy has restored the relationship to a more even keel and the election of PM Modi has kindled fresh hope that the much needed political traction will be infused into what is a very critical bi-lateral. This hope flickered through the Kerry and Hagel visits despite that fact that India chose to stay outside the global trade facilitation agreement in that very week, much to US disappointment. A brief review would indicate that on the major political, trade-economic and security-strategic issues, it is more of dissonance than consensus that animates the bi-lateral relationship. From Russia and Ukraine, to Israel-Gaza and the WTO amongst other recent developments, it is evident that Delhi and Washington have divergent assessments about how these issues affect their core national interests and security. Yet paradoxically, there is a correspondence over the central security concerns that each nation has prioritised. Over the last decade, both the US and India have flagged terrorism, non-state groups, deviant states, radical ideologies, weapons of mass destruction and the rise of China and have sought to either manage or contain these challenges - with limited success. Both have a shared interest in an equitable global trading system. While the transactional element is no doubt the tangible indicator of the robustness of the bi-lateral - often quantified in trade, technology and related fiscal indicators, as also in empathetic portico-diplomatic engagement - the deeper relevance of India and the US to each other is existential. US Secretary of State John Kerry with Prime Minister Narendra Modi. A stable and mutually beneficial bi-lateral relationship is central to the management and realisation of the anxieties and aspirations respectively, of the two largest democracies notwithstanding their divisive, domestic socio-political constraints. This was at the core of the radical Bush imitative in July 2005 to recast the troubled bi-lateral in a more normative manner and PM Manmohan Singh at the time was able to stay the course despite the many handicaps and banana peels that threatened to derail the process. For India, a robust relationship with the US is more critical than it is for the latter. This is a reality that needs to be internalised in the Indian polity and the attempt to advance the relationship by stealth was a major shortcoming of the UPA government. The NDA under PM Modi has the template outlined by PM Vajpayee post May 1998 as a guide. The challenge is to build on this and the Kerry-Hagel visits augur well. It would be misleading to infer that for India, realizing even a part of the much hyped potential for a more robust relationship with the US is a binary choice that will come at the expense of Moscow. India is currently in a favourable strategic orientation wherein all the major powers and clusters (such as the EMU and ASEAN) are supportive of a prosperous and credible India. The current dynamic of globalisation impels wide-spectrum engagement and subsumes complex contradictions. The China-Japan relationship is illustrative. The too frequently invoked and hence diluted term 'strategic partnership' has become ubiquitous in the Indian context. But the reality is that Moscow has in the past and will in the near future have a distinctive relevance for Delhi. In like manner. Improving ties with the US is not to be reduced to an anti-China posture. But there is little doubt that India's ability to engage with Beijing will be significantly enabled if it demonstrates the political confidence and clarity to pursue concurrent relationships notwithstanding their inherently contradictory texture. The ball is in the Modi court. 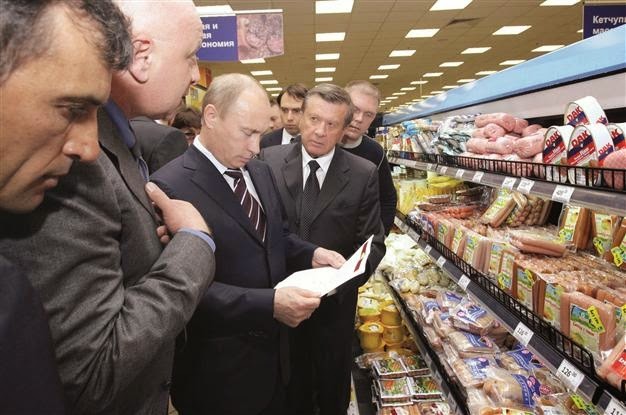 Russian President Vladimir Putin discussed with Belarusian President Alexander Lukashenko and Kazakhstan's President Nursultan Nazarbayev the coordination of trade and economy after Russia imposed food import embargo against a number of Western countries, the Kremlin's press center said on Thursday. Russia is going to rely on its economic partners outside the European Union for agricultural imports. At present, it is seeking to replace essential EU deliveries by products from blocs that Russia is a member of, including the fledgling Eurasian Economic Union (EAU) and the BRICS group of emerging economies. 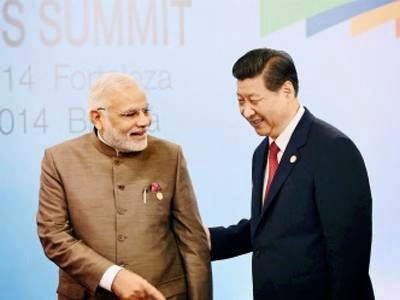 India is preparing to join the influential Shanghai Cooperation Organisation (SCO) strategic grouping, currently led by China and Russia, just days ahead of the Prime Minister's September visit to the US where his bonhomie with Moscow has already triggered unease. Indian foreign minister Sushma Swaraj is expected to travel to Dushanbe for the September meeting where India's membership will likely receive a formal stamp of approval. Vladimir Putin has agreed a $20bn (£11.8bn) trade deal with Iran that will see Russia sidestep Western sanctions on its energy sector. Under the terms of a five-year accord, Russia will help Iran organise oil sales as well as "cooperate in the oil-gas industry, construction of power plants, grids, supply of machinery, consumer goods and agriculture products", according to a statement by the Energy Ministry in Moscow. "The draft document between the Central Bank of Russia and the People's Bank of China on national currency swaps has been agreed by the parties," and is at the stage of formal approval procedures, ITAR-TASS quotes the Russian regulator's office on Thursday. "We are working to find out who was behind this recent wave of terrorism. This new wave is different than previous sporadic incidents. It looks an organized attempt with the support from outside China to spread violence in other parts of Xinjiang province. United States is habitual to sponsor groups that are against Chinese government to destabilize exceptional growth of China. UAA is one of such groups. There are strong links between Turkestan Islamic Movement and Saudi Arabia and United States. But diplomacy forbids China to raise such issues officially. This time China is gathering maximum information how this wave of terrorism is organized and sponsored. Links of UAA with terrorists working in region are clear but China does not want to place information in media unless it unearths whole networking spreading from China to Pakistan, central Asia and linked with Saudi Arabia and United States. ", claimed a terrorism expert working closely with Xinjiang authorities. A Uyghur judicial official and five Han Chinese businessmen have been murdered in separate incidents in China's troubled western Xinjiang region, local officials said this week, blaming a group of ethnic minority Muslim Uyghur suspects for the brutal slayings. Nurmemet Rozi, 37, the director of a township level justice department, was killed on July 18 when he was tracking down the identities of Uyghurs who had attended special prayers during the holy month of Ramadan at a village mosque in Aktokay township in Uchturpan (in Chinese, Wushi) county in Xinjiang's Aksu prefecture, the officials said. The five Han Chinese businessmen were stabbed to death after the suspects waylaid their car in Aksu city on July 12, they said. 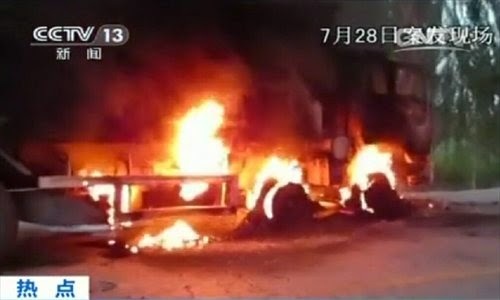 Chinese state media has not reported the two incidents so far, possibly to prevent the suspects from fleeing the prefecture or to avoid undue publicity that could deter Han Chinese from taking up jobs in Xinjiang, the homeland of the Turkic-speaking Uyghurs, local residents said. A city in China's restive western region of Xinjiang has banned people with head scarves, veils and long beards from boarding buses, as the government battles unrest with a policy that critics said discriminates against Muslims. 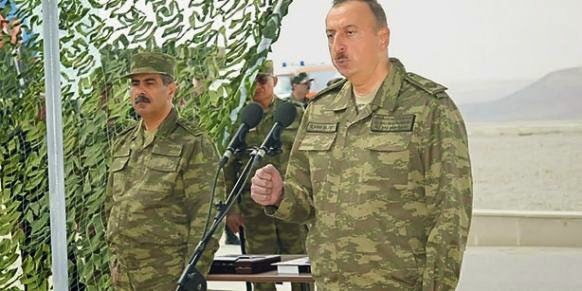 On Wednesday, Aliyev visited troops near the Aghdam region (which overeager Azerbaijani media had reported that its forces had already won back) and, in a military uniform, delivered a stemwinder of a speech, which he the next day summarized on twitter. He also seemed to support the theory that the uptick in fighting was intended to sharpen international attention on the conflict. "Azerbaijani citizens are not pleased with the activity of mediators because the main mission of mediators is to settle the conflict, not to keep it in a frozen state and conduct confidence building measures," he said. "The Azerbaijani army is showing its strength, which is having an impact on the talks... If the Azerbaijani army starts an offensive, the enemy will find itself in a very difficult situation. This is known to us, the enemy and the mediators. Therefore, I believe that the developments of recent days will prompt mediators to take some action." Russia, Azerbaijan and Armenia have agreed that the renewed violence in Nagorno-Karabakh enclave in the South Caucasus should be settled "in a peaceful way." Leaders of the three states held a joint meeting as tensions worsened in the disputed area. "I am glad to state that the President of Azerbaijan drew attention to the necessity of resolving the problem peacefully, and you [the President of Armenia Serzh Sargsyan] has agreed. This is, in fact, most important, because there is no greater tragedy than the death of people," Russian President Vladimir Putin said. Azerbaijani President Ilham Aliyev has also showed eagerness to resolve the conflict through negotiations "in the near future." By the decisions of the district courts, bank accounts of a number of non-governmental organizations (NGO) were frozen upon the application of the General Prosecutor's Office. A pplications of the General Prosecutor's Office to the court regarding the NGOs are mainly in the same context. According to the applications, the criminal case is investigated with the Criminal Code's articles #308.1 and #313 on the facts of the violation of law in the activities of Azerbaijan's some NGOs and branches and representative offices of foreign NGOs. As the representations of the German Marshall Fund of the United States, International Research & Exchanges Board (IREX), Open Society Institute Assistance Foundation of the Principality of Liechtenstein in Azerbaijan and the U.S. Embassy in Azerbaijan transferred large amount of funds to the bank accounts of these NGOs and there are evidences that those funds are subject of crime, it was demanded to arrest these bank accounts within the criminal procedure course to ensure complete, comprehensive and objective investigation, further confiscation of criminally obtained funds and to prevent the alienation. District courts also made judgment on the arrest of these bank accounts within the criminal procedure course. The scramble for natural resources is not a new phenomenon. Every state, either developed or developing, is always found busy 'managing' resources for its sustenance and growth. Minerals (also called materials) is one the crucial natural resource which plays a significant part in the development of both civilian and military industrial complexes of nation-states. There are a few minerals which are categorized as 'strategic' because of their importance for the industries and owing to natural and man-made difficulties in their procurement. This work debates the issues of strategic materials and their importance for nation-states. There has been an attempt here to contextualize the importance of strategic materials from a national security perspective. This study presents a macro view with regard to India's strategic minerals architecture and undertakes analysis to understand current and futuristic challenges and opportunities in this sector, and offers a few recommendations based on the assessment undertaken. Issues related to Rare Earth and new materials are also discussed. A promising offer from the United States to co-produce and co-develop military equipment and a suggestion for a trilateral military alliance to include Japan, leave India at a crossroads. Some hard-nosed decision making will be needed on how New Delhi accepts the US offers without seeming to move away from Russia or even remotely looking like a 'cat's paw' for America in the region. In other words, a fine balance has to be struck between the US and Japan on one side and Russia and China on the other side - a balance that could put the Indian diplomacy to test. US Secretary of Defence Chuck Hagel, who ended his three-day visit to India yesterday, raised two specific issues. First, he showed keenness to co-produce military equipment, unfettered access to technology that is reserved for countries like UK, Canada or Australia. Second, he asked India to make a strategic shift and forge a trilateral alliance with the US and Japan, buttressing it with "as the US and Indian security interests converge, so should our partnerships with other nations". In case New Delhi accepts this, it will have to be seen equidistant from the decades-old Japan-China acrimony. Japan has given some major infrastructure like the Delhi Metro and the Delhi-Mumbai Industrial Corridor (DMIC). What India awaits is Japanese Prime Minister Shinzo Abe's plan of shifting the thousands of Japanese factories in China to India along the upcoming DMIC and also the Chennai Bangalore Industrial Corridor (CBIC). Former Defence Minister AK Antony was not so keen on co-development ties with the US but had allowed purchase of specialised planes, the C-17 and the C-130-J for the Indian Air Force and the Boeing P8-I for the Navy. After 2008, the US won military contracts worth military $9 billion (approx Rs 54,000 crore). Al those years when India was in the Soviet Union bloc during the Cold War, the US did business worth only $ 500 million (Some Rs 3,000 crore at today's value). Between 2009 and 2013, India imported 14 per cent of all global arms sold and Russia accounted for 79 per cent of those supplies, said the Stockholm International Peace Research Institute (SIPRI) in its March 2014 report 'trends in international arms transfers for the period 2009-1013'. India has joint development project with Russia, France and Israel. The US has offered a similar tie-up. India may find it tough to sever its umbilical cord from Russia. As of today projects worth $39 billion are in the pipeline with Moscow including co-development of the next generation of fighter jets. The Russia has helped New Delhi in its indigenous nuclear submarine, the Arihant. At its launch in 2009, Prime Minister Manmohan Singh was candid: "I would like to express our appreciation to our Russian friends for their invaluable cooperation". Moscow has also leased out a nuclear submarine, the Chakra. Long standing ties with Russia means India has more often than not voted along pro-Moscow line at the international forum, recently on the conflict in Ukraine. Antony's successor Arun Jaitley, carries no such baggage or history of dithering on deeper ties with the US, rather by raising the level of foreign direct investment, to allow foreign firms to hold 49 per cent stake in military equipment-producing firms, he has sent out a signal. New Delhi will also be looking to factor in apprehensions and looking for assurance that no hurdle shall be placed at the behest of altered US interests. New Delhi, Aug. 8: India looks set to reboot its military ties with the US starting with the Prime Minister's scheduled Washington trip in September after the defence ministers today decided to renew an overarching pact and appointed executives to oversee defence technology ventures. "The Prime Minister underlined the importance of defence relations in the overall strategic partnership between the two countries and indicated his desire to see further progress in defence relations, including in defence manufacturing in India, technology transfer in the area of defence, exercises and higher studies in the field of defence," the Prime Minister's Office said after US secretary of defence Chuck Hagel met Narendra Modi here this morning. The government also announced that defence minister Arun Jaitley would visit the US in October. Hagel had said on his way to India that his objectives were to start early talks to renew a 10-year New Framework for the India-US Defence Relationship pact that is due to expire in July 2015. The agreement, which governs all aspects of the defence relationship including technology transfers, weapons sales, exercises and exchanges of personnel and training, was signed in 2005 when Pranab Mukherjee was defence minister. Hagel had also said he was keen to push forward a Defence Trade and Technology Initiative (DTTI), agreed during Manmohan Singh's visit to the US as Prime Minister in September last year. After the delegation-level meetings headed by Jaitley and Hagel, "the two sides decided to take steps for the extension of the New Framework for the US-India Defence Relationship, well before it expires in July 2015," an Indian defence ministry release stated. The two sides also named India's secretary, defence production, and the US undersecretary for acquisition, technology and licensing at the Pentagon as the contact persons for the DTTI. The DTTI too was agreed during a Singh-Obama summit but the US perception was that the Indian defence establishment under A.K. Antony was going slow on the 10 projects the US had proposed for co-production and co-development. Among these projects are an anti-tank guided missile, an attack helicopter, an unmanned aerial vehicle and a heavy gun. What America has taken away from the talks, which follow visits by its secretaries of state and commerce, is likely to be evident tomorrow after a lecture that Hagel is slated to deliver at a meeting organised by the Observer Research Foundation, a Reliance Industries-sponsored think tank. A US defence department release on Hagel's meetings with Modi and foreign minister Sushma Swaraj quoted the Pentagon press secretary, Rear Admiral John Kirby, who said Hagel and the Indian leaders had discussed the importance of continuing robust defence cooperation, particularly in terms of co-development and co-production, and through military education and training exchanges. "Modi's forward-looking agenda for his summit with President Barack Obama in the fall was part of Hagel's discussion with Modi," Kirby said. Sources in India said Hagel had asked Sushma whether India would be willing to expand security cooperation in the Indian Ocean and Pacific regions, senior officials said. Hagel, the officials said, at least twice articulated Washington's interest in increasing military exercises not just between India and the US but also including Japan and possibly other Pacific nations. Hagel, officials said, also probed Sushma on the Modi government's position on China's territorial disputes with Japan and South Korea in the East China Sea and with the Philippines and Vietnam in the South China Sea. Sushma, the officials said, iterated India's stance on those disputes — that all nations must ensure that sea trade routes are not obstructed and that the UN Convention on the Law of the Sea is adhered to, but the disputes should be resolved solely bilaterally. China is sensitive to any move by the US and Japan that it perceives as aimed at yanking India into an alliance aimed at containing Beijing's own strategic clout. When Japan Prime Minister Shinzo Abe proposed a "Quadrilateral Security Dialogue" consisting of the US, Japan, Australia and India in his first term in office, China protested formally with each of these four nations. It also objected to joint naval exercises conducted by the US, India, Japan, Australia and Singapore in 2007. Security issues affecting the subcontinent and how they impact the US-India relationship figured in all the meetings. Jaitley said he expected more technologies to flow in after raising the FDI cap in defence. "The development of our own indigenous capabilities is a major objective that guides our present policies. In this direction, we have taken steps to raise the FDI cap in the defence sector. We look forward to work closely with the US in this regard," he said. The spread of misinformation through online social networks is becoming an increasingly worrying problem. Researchers in India have now modeled how such fictions and diffuse through those networks. They described details of their research and the taxonomy that could help those who run, regulate and use online social networks better understand how to slow or even prevent the spread of misinformation to the wider public. Krishna Kumar and G. Geethakumari of the Department of Computer Science and Information Systems, at BITS-Pilani, Hyderabad Campus, in Andhra Pradesh, India, explain how we are increasingly reliant on information we obtain from online sources. However, our implicit faith in the validity of that information can be counterproductive and can make some people and organizations vulnerable to exploitation, perhaps by those spreading the misinformation and others. The team refers to this as a "semantic attack" and regards it as the "soft underbelly of the internet." The team suggests that online social networks have added an additional layer of challenges for the detection of such semantic attacks above the conventional world-wide web and other internet services. As such, the rate of diffusion of misinformation can be very rapid as evidenced by recent events driven by panic spreading online regarding so-called "swine" flu in 2009 and a mass exodus from an Asian nation also driven by unnecessary online panic. As with the transfer of information through any network, the nodes (the users in a social network) and how they are connected to each other is also critical to the diffusion of misinformation, the researchers report. For example, friendship links on Facebook and the follower/followee relationship on Twitter affect the impact and reach of given updates on those services from particular users. Connections and connectivity have been well studied in recent years, but the concept of a semantic attack in which misinformation is deliberately seeded into a social network with the aim of affecting the behavior of the maximum number of people possible has only recently emerged as a troubling concept that requires detailed study. While there are firewalls, antivirus programs and other technological diagnostics and defenses to ward off attacks on servers, operating systems and software, defending against the impact of a semantic attack on human emotions and behavior is an entirely different matter. The above story is based on materials provided by Inderscience Publishers. Note: Materials may be edited for content and length. Inderscience Publishers. "Misinformation diffusing online." ScienceDaily. ScienceDaily, 31 July 2014. <www.sciencedaily.com/releases/2014/07/140731111015.htm>.